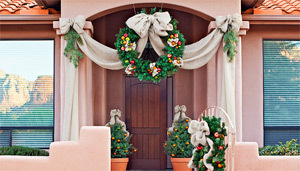 Last-Minute Decorating Tips View in your browser. 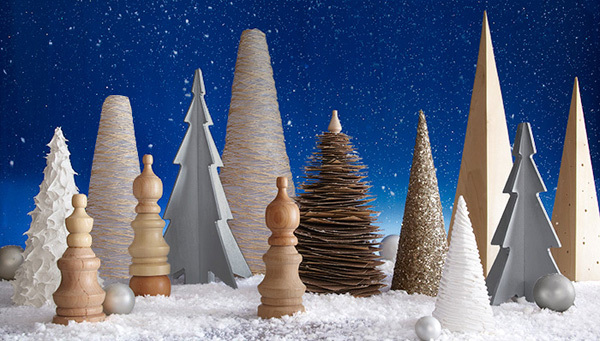 Add a small dose of Christmas cheer to any room with our festive assortment of DIY trees. 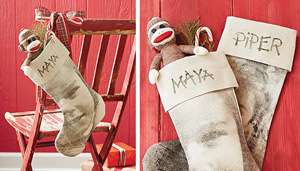 They're perfect for bedrooms, mantels, or a dining room centerpiece. Transform plain canvas into a family heirloom and showcase images of family and friends. 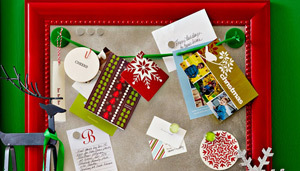 Add holiday cheer to an unexpected place this season. 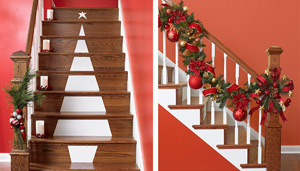 This staircase Christmas tree decoration serves as the perfect backdrop for family photos. Give old picture frames a special role this year. Reuse them as bright spaces to display cards, ornaments, and art. Big on Holiday Projects but Short on Time? 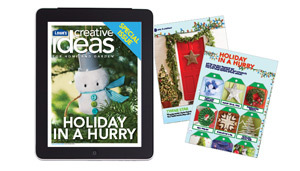 Download our Holiday in a Hurry issue in the Lowe's Creative Ideas Magazine app for the iPad—and check out 27 easy projects you can make before guests arrive! 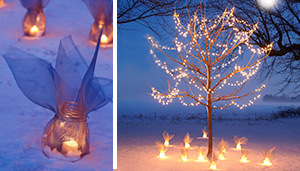 Wrap economical canning jars in window screen fabric for airy sculptures during the day and warm, glowing luminaries at night. 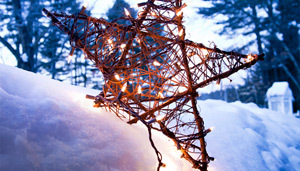 This easy project made from wood dowels wrapped with wire, grapevine, and mini lights adds star power to your outdoor space. 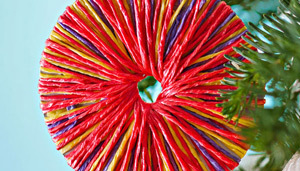 Give a plain wreath a natural touch of color by decorating it with fresh fruit. 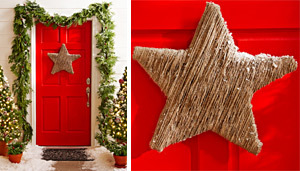 Wrap jute around a frame made from wooden shims for a Christmas decoration with a natural, rustic look. You can make this project for less than $10. 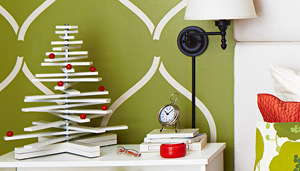 Add style to your holiday decorating with this easy-to-make Christmas tree. The Scandinavian-inspired design uses pine craft boards and hardware to create moveable branches. 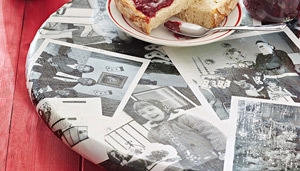 Create a decoupage serving tray or Lazy Susan personalized with your family photos. Here's a quick idea for an ornament that's as easy as it is fun. 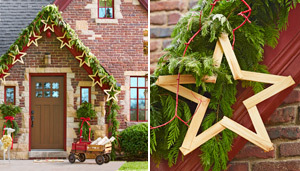 Build these simple stars by the dozen to display indoors or out. Each one only costs about $2. 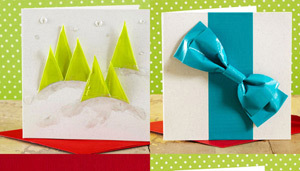 Send friends and family something really special: handmade cards created from duct tape, veneer, and Dazzle Twine. 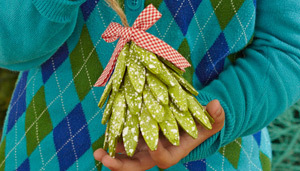 Brighten your Christmas tree with a colorful ornament so simple your kids can make it for less than $4. This snazzy snowman won't melt away. 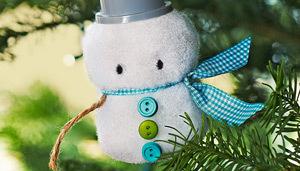 Create this festive fellow for your ornament collection. 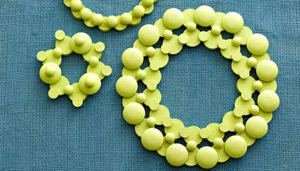 Painted poplar buttons and plugs come together to form a lovely ornament. Feel free to have the kids give you a hand. 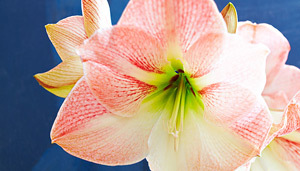 Amaryllis plants are surprisingly easy to grow. 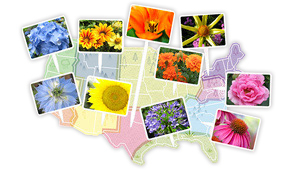 Colorful petals add instant eye-catching style in any room of the house. 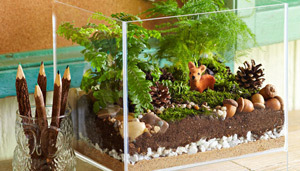 Here's a fun holiday project: create a decorative terrarium for a desk or tabletop. Make it yourself in just a few hours. Spring comes early! 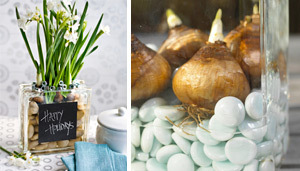 Coax spring-blooming bulbs to bloom early indoors.